If you're making puff pastry from scratch, make it and chill it for an hour before starting this recipe. Here's the one I used. Puff Pastry from All Recipes. It's most manageable if you divide the dough in half, then chill it. You can use commercial puff pastry if you're in a hurry, or if you don't really want to make your own. Place lavender buds in a small bowl. Boil 1/4 cup of water and pour over the lavender. Let it steep until it cools. When cool (room temp is fine), strain the buds and discard them. Save the water. In a small mixing bowl, mix the chèvre, honey and black pepper. The mixture should be thick and creamy so add the lavender water a tablespoon at a time. I used 2 tablespoons of water. Mix thoroughly. You can make this a day ahead and refrigerate. When you're ready to assemble the pastries, preheat your oven to 400 degrees. Slice the figs. 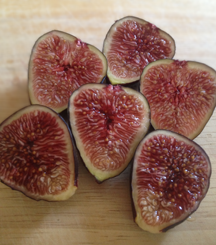 You'll get 3 or four slices per fig. On a lightly floured surface, roll one of the chilled pastry balls into a rectangle approximately 9" x 12." With a sharp knife, or a pizza cutter, cut into 12 equal (3") squares. You will repeat with the second ball of dough but for now, keep it in the refrigerator. Place about 2 teaspoons of the chèvre mixture in the middle of each square. 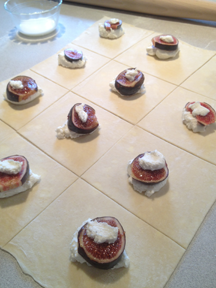 Top each with a fig slice. Add one more dollop of chèvre on top of the fig. 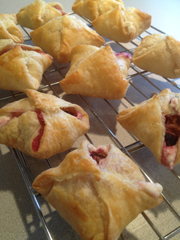 The extra chèvre helps hold the dough in place when you assemble the pastries. Pour the half and half into a shallow bowl. 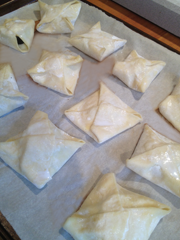 Fold each corner of the pastry into the center and over the filling. You may need some of the half and half to hold it together. It's okay if the edges overlap a bit. 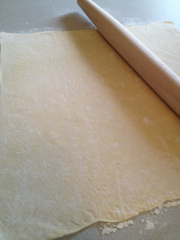 The puff pastry has a tendency to pull apart and open up when it bakes. If they are left open, the cheese will melt and the filling will be gone. You can see that some of mine didn't open up at all. That's okay. The finished pastry will be about 2 inches square. Brush each with some of the half and half to get a rich golden color when they're baked. Line a baking sheet with parchment paper and place the pastries about an inch (or more) apart. Place on the middle rack of the oven for 12-15 minutes, until golden. Serve warm, or room temperature, with fresh fruit. These look wonderful! 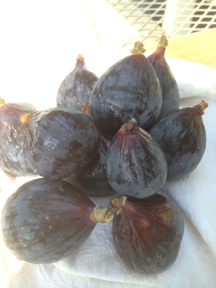 Now if the figs on my tree would ripen, I could give it a try!